An easy care and eye catching plant, the Tree Dahlia is Dahlia imperialis, a tall perennial originally from South America. Grown for the flowers that appear on long bamboo like canes in early winter, the Tree Dahlia is a plant that can add a little seasonal height to the garden, with very attractive flowers. Growing from tubers, this is a plant that loves a sunny position and a humus rich soil. Plant it at the back of the border where the flowers will rise above all else in winter. A few varieties are available, mainly to do with flower colour and form. D. imperialis ‘Dark Pink’ – Deep pink flowers. D. imperialis ‘Double White’ – Large ruffled ‘Double White’ flowers. You will either be purchasing a tuber, or you will be planting cuttings. Either way planting instructions are similar. Plant the tuber around 10 cm deep, cover with soil and wage run well. With cuttings, the instructions are the same, the whole cutting is layer flat and covered with 10 cmd of soil. 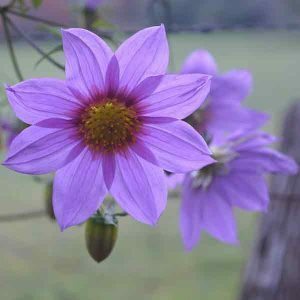 You can propagate Tree Dahlias from cutting or by dividing the tubers, or rhizomes. Cutting are best taken near the end of winter as they begin to die back after flowering. Tree Dahlias will shoot from the nodes of the old stems if you follow this method. Cut the stems right back to the base of the plant. Trim the old foliage away. Cut the stems into lengths that have 3 nodes on them. Dig a shallow trench where you want the new plants to grow. Lay a cutting in the trench . Cover with around 10 cms of soil. Plants will shoot the next season. You can also lay the cuttings in large pots or containers if you wish, follow a similar procedure as above. In a humus rich soil and a sunny position Tree Dahlias require very little care. They are best planted in a protected position as the stems tend to be brittle and can break easily in windy conditions, especially when in full flower. They are also best in a position where they are protected from frosts. Pruning Tree Dahlias is carried out in two ways. The plants are simply cut back to ground level at the end of winter after flowering. This is carried out in summer. The new shoots are let grow to around 30 cm and then cut back to around 15 cm. This helps create a more compact plant, less likely to be damaged by wind. Tree Dahlias are available for sale online from the following nurseries. Dahlia specialists: A large range of Dahlia types including : Decorative, Cactus, Pompone, Water Lily, Ball, Collarette, Orchid, Stellar, Fimbriated, Exhibition, Anemone, Peony, Baby Dahl's, Bronze Foliage, Singles.